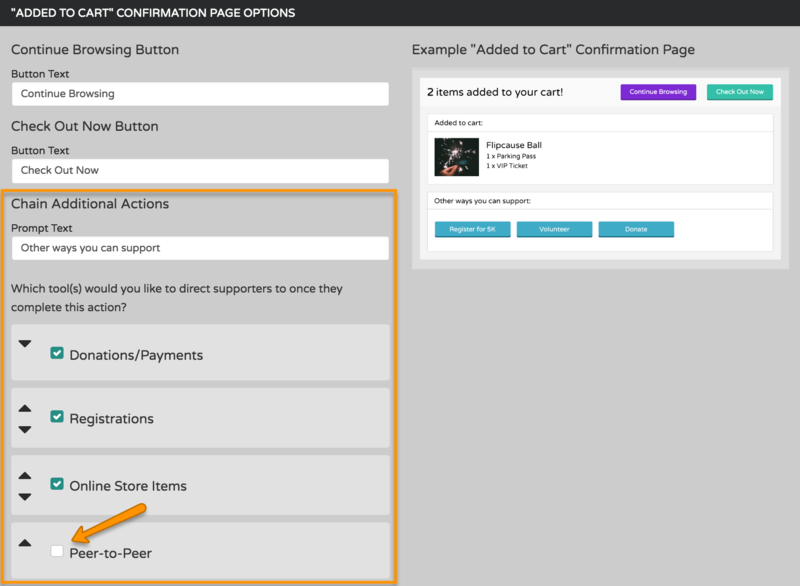 Note: If you have the Cart feature turned off, check out our article on Chain Actions for adding peer-to-peer to your transaction flow. The Shopping Cart feature creates seamless, all-in-one transactions for your supporters. 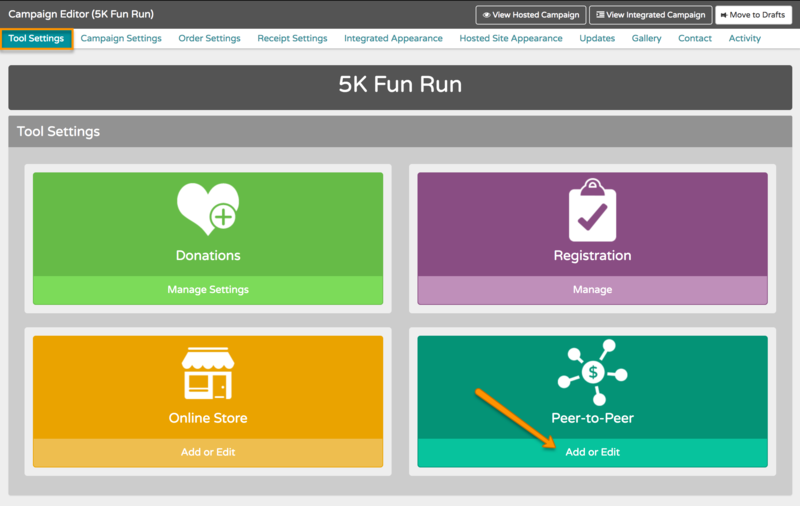 When adding the Peer-to-Peer tool within a campaign where the Shopping Cart is enabled, there are a few steps you should take to streamline the checkout flow for supporters. To do this, you'll want to edit when your Peer-to-Peer tool appears within Chained Actions. When a supporter clicks to become a peer fundraiser, a new window will open and an independent transaction flow will begin. The cart will remain active for the set amount of time, but the supporter will have to navigate back to their original window. To allow your supporters to complete their initial checkout flow without interruption, we'll want to place the peer fundraising call-to-action only at the very end. 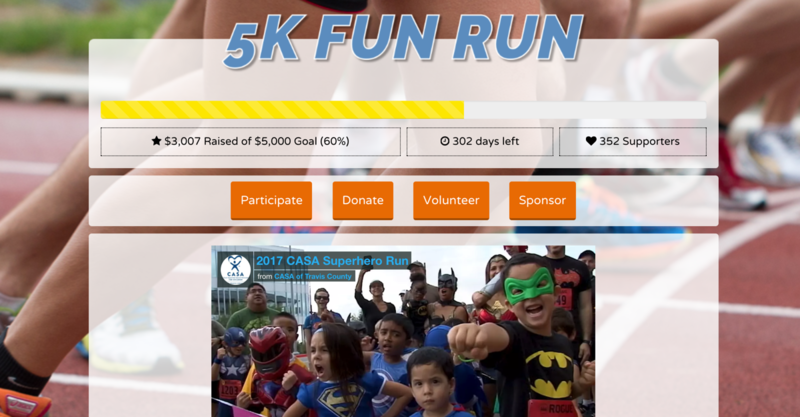 For example, in this 5K campaign, we want to make sure everyone who engages with our campaign (signing up to run, sponsoring the race, donating to our nonprofit, and/or volunteering the day of) will be prompted to take another available action immediately after (and not before) completing checkout: Start Fundraising. First, you'll want to make sure your campaign is setup and the Shopping Cart is toggled to 'Yes' within Campaign > Edit This Campaign > Order Settings > Cart Settings. Once you've activated the cart, scroll down to configure the "Added to Cart" Confirmation Page Options. In this section, you'll want to edit the settings for Chain Additional Actions. The tool checkboxes here determine what actions a supporter is directed to take after adding an engagement to their cart (see the Example "Added to Cart" Confirmation Page). You can choose what tools to display in this section depending on your needs. Next, you'll scroll down to the following section where you can edit your Cart Thank You Page Options. Here is where you customize the Title and Message of your thank you page to invite your supporters to start peer fundraising. To do this, make sure that under Chain Additional Actions, the Peer-to-Peer checkbox is checked. Note: You can choose to direct supporters to other tools as needed, but Peer-to-Peer should be the first. 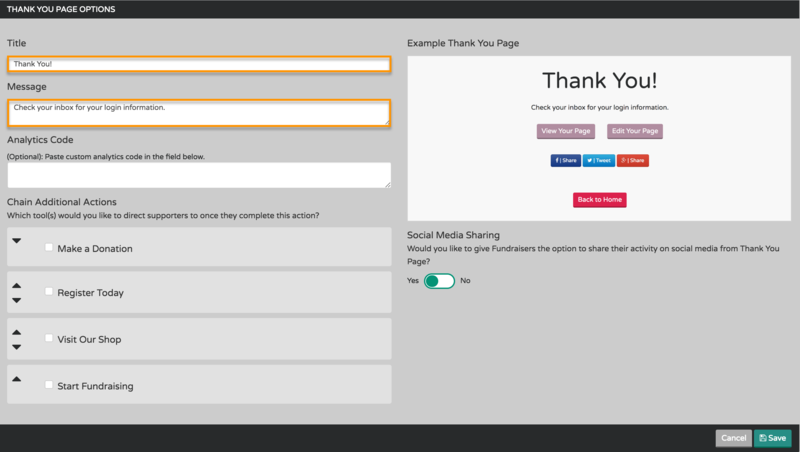 To change the order in which they appear on your thank you page, you can use the arrows at the left of each tool move the them up and down the list. After this is complete, make sure to click Save. 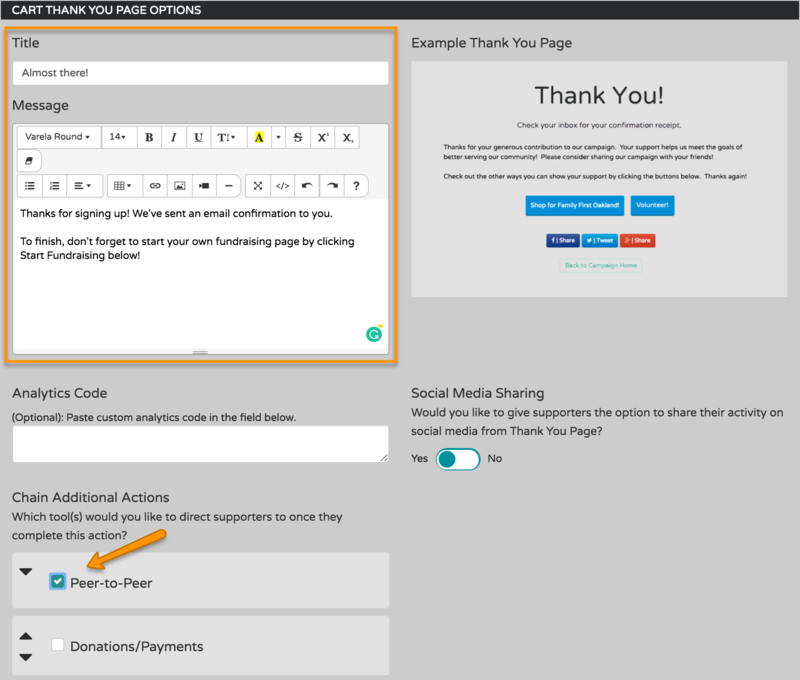 The final (optional) step is to customize the Thank You Page settings for your Peer-to-Peer tool. Since this transaction flow is separate from the shopping cart checkout process, your supporters will see a separate thank you message as well. Hit Save when you're done making changes and you're ready to go!